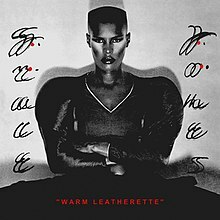 Warm Leatherette is the fourth studio album by Grace Jones, released on 9 May 1980 by Island Records. The album features contributions from the reggae production duo Sly and Robbie and is a departure from Jones' earlier disco sound, moving towards a new wave-reggae direction. Although having established herself as a performer with a string of club hits in the US and a large gay following, Jones had only achieved very modest commercial success with her first three disco albums. For Warm Leatherette, Jones went through a musical and visual reinvention. The singer teamed up with producers Chris Blackwell and Alex Sadkin, and Sly and Robbie, Wally Badarou, Barry Reynolds, Mikey Chung and Uziah "Sticky" Thompson, aka the Compass Point Allstars, for a record that would be a total departure from disco and an exploration of new wave music, blending reggae and rock. Warm Leatherette was the first of three albums recorded at the Compass Point Studios in the Bahamas. According to John Doran of BBC Music, Warm Leatherette is a "post-punk pop" album that, "delved into the worlds of disco, reggae and funk much more successfully than most of her 'alternative' contemporaries, while still retaining a blank-eyed alienation that was more reminiscent of David Bowie or Ian Curtis than most of her peers." David Bowie influences were also noted by Joe Muggs of Fact. The album includes covers of songs by The Normal, The Pretenders, Roxy Music, Smokey Robinson, Tom Petty and the Heartbreakers and Jacques Higelin. Blackwell intended to make a record with "a harsh sound that was heavy with Jamaican rhythm". Sly Dunbar revealed that "Warm Leatherette", the first song on the album, was also the first to be recorded with Jones. For Jones' version of "Breakdown", Tom Petty specially wrote a third verse for the song. The album also includes one song co-written by Jones, "A Rolling Stone", and one French track, "Pars" (French for "Leave"), a reggae re-imagining of Jacques Higelin's song. "Pull Up to the Bumper" was also recorded during the sessions for Warm Leatherette, but its R&B sound was found not fitting in the rest of the material and so it appeared on Jones' next album, Nightclubbing in 1981. The vinyl LP release of the album included shorter, 7" versions of some of the songs, due to limited capacity of the vinyl format. Most compact disc editions included extended 12" mixes of selected tracks that had originally appeared on the single-sided chrome audio cassette. Warm Leatherette charted only in Australia, the UK and the US. Although it remains one of the least successful Grace Jones albums in terms of sales and chart performance, it holds the credit for being her breakthrough record in the UK. It is also one of the highest-rated of all her studio releases. 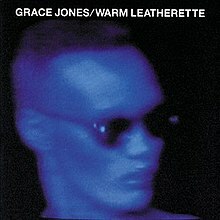 Warm Leatherette was the first Jones album with cover art designed by her then-boyfriend, Jean-Paul Goude, which presented the singer's androgynous look for the first time. It featured a black and white photograph of Jones pregnant, with her signature flattop haircut, sitting with her arms crossed. Chris Blackwell praised it as "a very powerful image". After the commercial success of Nightclubbing, Island Records re-released the Warm Leatherette album with new artwork, replacing Jean-Paul Goude's original cover with a picture of Jones performing "Walking in the Rain", taken from her 1982 concert video A One Man Show. The image featured on the back cover was a snapshot of Jones singing "Warm Leatherette", also from A One Man Show. Some subsequent CD releases would adopt the new artwork with the original studio portrait included in the inner sleeve. "A Rolling Stone" became the lead single in the UK, while "The Hunter Gets Captured by the Game" was chosen as the first single for the North American market. Both singles failed to enter mainstream charts; however, the latter made it to the R&B chart in the US. "Love Is the Drug" quickly followed the unsuccessful "A Rolling Stone", but did not make any chart impact until six years later, when a remixed version of it garnered considerable attention. "Warm Leatherette" was another US-only single, where it reached the top 20 on the dance chart. The most successful single off the album, and Grace Jones' breakthrough song, was "Private Life", which entered the top 20 of singles chart in the UK, becoming her first chart entry in that country, and has since become one of her signature songs. Two more singles were later released from the album, "Breakdown", only in the US, and "Pars", but both were commercially unsuccessful. AllMusic critic Ron Wynn wrote that "the overall album had more energy and production gloss than previous LPs that had been aimed completely at the club market." Music critic Robert Christgau thought that "with Smokey Robinson and Chrissie Hynde scripting adventures in dominance and fellow Jamaicans Shakespeare and Dunbar adding cyborgian oomph, the theoretical allure of her persona is finally made flesh." ^ a b c Doran, John (2010). "Grace Clubbing - Nightclubbing review". BBC. Retrieved 3 August 2016. ^ Muggs, Joe (2 May 2014). "I've Seen That Face Before: looking back on Grace Jones' iconic Nightclubbing with the people who made it happen". Fact. The Vinyl Factory. Retrieved 30 July 2016. ^ a b "The World Of Grace Jones". www.theworldofgracejones.com. Archived from the original on 2011-11-14. Retrieved 2012-05-26. ^ "The World Of Grace Jones". www.theworldofgracejones.com. Archived from the original on 2011-11-14. Retrieved 2012-05-26. ^ Joey Michaels. "3349. "Breakdown" by Grace Jones". sadclownrep.com. Archived from the original on 2013-10-12. Retrieved 2012-05-23. ^ "Pull Up to the Bumper by Grace Jones Songfacts". www.songfacts.com. Retrieved 2012-02-02. ^ "Grace Jones". www.allmusic.com. Retrieved 2012-05-27. ^ "Films and Music by Grace Jones". rateyourmusic.com. Retrieved 2012-05-27. ^ "Images for Grace Jones – Warm Leatherette". www.discogs.com. Retrieved 2012-05-27. ^ a b Ron Wynn. "Warm Leatherette – Grace Jones". Allmusic. Retrieved 2006-12-28. ^ Hillier, Bev. "Albums". Smash Hits (June 12–25, 1980): 31. ^ T Cole Rachel. "Warm Leatherette – Grace Jones". www.pitchfork.com. Retrieved 2016-09-21. ^ "The Official Charts Company – Warm Leatherette by Grace Jones Search". The Official Charts Company. 6 May 2013. ^ "Grace Jones". www.allmusic.com. Retrieved 2009-11-11. ^ "Ultratop.be – Grace Jones – Warm Leatherette" (in Dutch). Hung Medien. Retrieved July 27, 2016. ^ "Ultratop.be – Grace Jones – Warm Leatherette" (in French). Hung Medien. Retrieved July 27, 2016. This page was last edited on 24 March 2019, at 15:02 (UTC).